Dimension-hopping is something of an X-Men rite of passage, and it's about time the All-New X-Men took the plunge! You don't always have to travel Miles away to visit a new place...but will the Web these time-displaced young X-Men find themselves tangled in Ultimately bring about their end? 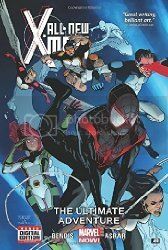 Okay, enough subtlety: the All-New X-Men meet Miles Morales, the Ultimate Spider-Man - and this is a showdown you won't want to miss! Plus: it's Iceman unleashed, as young Bobby Drake takes the offensive! And for someone who's said that she doesn't find him particularly pleasant to be around, X-23 seems to have taken an odd interest in the high-flying Angel. Tune in as yesterday's X-Men continue to explore the fear-fraught future of the present day! All I could think starting this collection was Bendis really can't seem to get away from time travel/alternate universe stories right now, can he? Expecting nothing very spectacular out of this collection since he just seems to retread the same territory time and again right now, imagine my surprise when this story actually turned out to be good! The All-New X-Men find themselves in the Ultimate Universe and I found it was actually intriguing to see how the heroes of the Marvel Universe and the heroes of the Ultimate Universe view the world around them, and how the world in turn views them. I thought it was a nice juxtaposition and actually almost a fresh look at how these heroes (who are essentially the same characters, just brought up in wildly different circumstance) react to situations. Honestly, the story itself wasn't all that memorable (truth to tell, I'm writing this several weeks after I read the collection, and beyond knowing the X-Men traveled to the Ultimate Universe, I really couldn't tell you much more about it). Bendis, even creating a story that I found interesting on the underlying themes, still can't seem to write something that seems original all around. After story after story after story of time travel/alternate universe stories lately, one more such story, no matter how well written, still feels like it was already done last month (and the month before that...). Immonen's art is fantastic, and it was good to see him back on the title. I'll keep reading the series (I'm such an X-Men lemming), but I'm hoping that the upcoming Secret Wars storyline will actually see Bendis honestly off the X-Men titles for good.